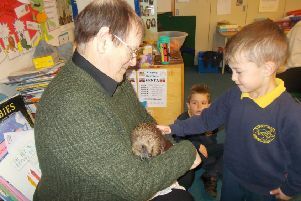 A professional storyteller captivated the imaginations of pupils from Thakeham Primary School during a visit last week. Organised by housebuilder Barratt Homes, Ross James Montgomery was welcomed to the school in Rock Road as part of National Storytelling Week which ran from Saturday January 26 until Saturday February 2. Samantha Norton, headteacher at the school, commented: “The children had a great time. Storytelling awakens children’s imaginations and it has been an incredible treat for them. “They were totally captivated by Ross and loved getting to know the characters he introduced us to. Listening to these stories was an excellent way to develop the love of being read to. Set up in 2000 by The Society for Storytelling, National Storytelling Week has been used to increase public awareness of the art, practice and value of storytelling. The society sees a story as the traditional medium of communication from generation to generation, a tool for expression which can be enjoyed by everyone. Storyteller Ross said: “There is nothing better than being transported into another world with a great story. This passion for stories and being read to starts at home and needs to be encouraged throughout school life. Barratt Homes arranged the visit to the school, which is located close to the housebuilder’s Warren Grove development on Robell Way, as part of its ongoing Education Programme. Lynnette St-Quintin, sales director for Barratt Homes Southern Counties, commented: “We were happy to support National Storytelling Week again this year. “As part of our ongoing Education Programme, we actively promote learning experiences such as these and were delighted to arrange Ross’s visit to the school.